مستغنی, علیرضا, اعتمادی, شهرزاد. (1395). چگونگی شکل گیری حس مکان در کودکان. معماری و شهرسازی آرمان شهر, 9(17), 103-113. علیرضا مستغنی; شهرزاد اعتمادی. "چگونگی شکل گیری حس مکان در کودکان". معماری و شهرسازی آرمان شهر, 9, 17, 1395, 103-113. مستغنی, علیرضا, اعتمادی, شهرزاد. (1395). 'چگونگی شکل گیری حس مکان در کودکان', معماری و شهرسازی آرمان شهر, 9(17), pp. 103-113. مستغنی, علیرضا, اعتمادی, شهرزاد. چگونگی شکل گیری حس مکان در کودکان. معماری و شهرسازی آرمان شهر, 1395; 9(17): 103-113. 1استادیار معماری، دانشکده معماری و شهرسازی، دانشگاه هنر، تهران، ایران . 2دانشجوی کارشناسی ارشد معماری داخلی، دانشکده معماری و شهرسازی، دانشگاه هنر، تهران، ایران. حس مکان، عاملی است که در شک لگیری هویت انسان تأثیر به سزایی دارد. بخش مهمی از هویت هر فرد در دوران کودکی و با توجه به تصویر های ذهنی و خاطرات جمعی و مکانی وی پایه ریزی می شود؛ به گونه ای که زمینه ساز بسیاری از روحیات و ویژگی های فردی و اجتماعی همچون کاهش اضطراب، دستیابی به عزت نفس و روحیه جمعی و تعاملی و غیره در افراد جامعه خواهد بود. بنابراین بررسی مفهوم حس مکان و عوامل شک لدهنده آن به ویژه در دوران کودکی، امری ضروری است که در این پژوهش به آن پرداخته خواهد شد. این مقاله به روش تحلیلی– توصیفی و برپایه مرور منابع کتابخانه ای در زمینه روانشناسی محیط و روانشناسی کودکان نگارش شده است. از این رو ابتدا به معرفی مکان، حس مکان و عوامل شک لدهنده آن به طور کلی پرداخته شده و سپس ضرورت ایجاد این احساس تعلق به مکان، در کودکان مورد مطالعه قرار م یگیرد. در ادامه با بیان ویژگی های کودکان از درک مفهوم دلبستگی در سنین مختلف، به جایگاه دلبستگی به مکان در شکل گیری هویت آن ها اشاره خواهد شد. در نهایت با معرفی مکان های مورد علاقه کودکان و ویژگی های شکل دهنده آن، به ارائه راهکارهای عملی و الگویی جهت ایجاد حس مکان در کودک م یپردازد. نتایج حاصل از بررسی ها و تطابق ها، حاکی از تأثیر به سزای عوامل فعالیتی و تعاملی در غالب بازی- مشارکت، برای دخل و تصرف در مکان توسط کودک و مشارکت او در طراحی فضاها و ایجاد قلمروهای شخصی می باشد. Bowlby, J. (1982). Attachment and Loss, Vol. I: Attachment, 2nd Ed. New York: Basic Books. Bretherton, I. (1985). Attachment Theory: Retrospect and Prospect. In I. Bretherton and E. Waters, eds. Monographs of the Society for Research in Child Development. Vol. 50, nos. 1-2. Chicago: The University of Chicago Press. Chatterjee, S. (2005). Children’s Friendship with Place: A Conceptual Inquiry, Children Youth and Environments, Environmental Health, and Other Papers, 1-26. 15(1). Chawla, L. (1992). Childhood Place Attachments. In A. Altman and S.M. Low, eds. Place Attachment. New York: Plenum. Vol. 12. Chawla, L. & Heft, H. (2002). Children’s Competence and Ecology of Communities: A Functional Approach to the Evaluation of Participation. Journal of Environmental Psychology. 22, 201-216. Childress, H. (2004). Teenagers, Territories and the Appropriation of Space. Childhood. 11(2), 195-205. Doll, B. (1996). Children without Friends: Implications for Practice and Policy. The School Psychology Review. 25(2), 165-183. Daneshpour, A., Sepehri Moghadam, M. & Charkhchian, M. (2009). Explanation of the Sense of Space and Analyzing of Dimensions and its Different Aspects. HONAR-HA-YE-ZIBA, 38, 37-50. Falahat, M.S. (2006). The Sense of Space and Its Factors. HONAR-HA-YE-ZIBA, 26.57-66. Fisher, R. (2007). Teaching Children to Think. (M. Safaie Manesh & A. Najarian, Trans.). Ahvaz: Rasesh Organization. Gibson, J.J. (1979). The Ecological Approach to Visual Perception. Boston: Houghton Mifflin. Gordon J. (2010). Place Matters: The Significance of Place Attachments for Children’s Well-Being. British Journal of Social Work, 40, 755-771. Hart, R. (1979). Children’s Experience of Place. New York: Irvington Publishers, Distributed by Halsted Press. Hartrup, W.W. (1989a). Social Relationships and Their Developmental Significance. American Psychologist, 44, 120-126. Hinde, R.A. (1979). Towards Understanding Relationships. London and New York: Published in Cooperation with European Association of Experimental Social Psychology by Academic Press. Habibi, R.S. (2008). Images and the Meaning of Place. HONAR-HA-YE-ZIBA, 35, 39-50. Hertzberger, H. (2009). Lessons for Students in Architecture (B. Mirhashemi & B. Khabaz Beheshti, Trans.). Tehran: Arad Organization. Korpela, K. (2002). Children’s Environment. In R.B. Bechtel and A. Churchman, eds. Handbook of Environmental Psychology. New York: John Wiley and Sons, 363-373. Kytta, M. (2003). Children in Outdoor Contexts: Affordances and Independent Mobility in the Assessment of Environmental Child Friendliness. Helsinki: Helsinki University of Technology. Matthews, M. H. (1992). Making Sense of Place: Children’s Understanding of Large-Scale Environments. Hemel Hempstead, Harvester Wheat sheaf Sustainable Development Commission (2007) Every Child’s Future Matters, London, SDC. Modiri, A. (2008). Place. Hoviateshahr Journal, 2, 69-79. 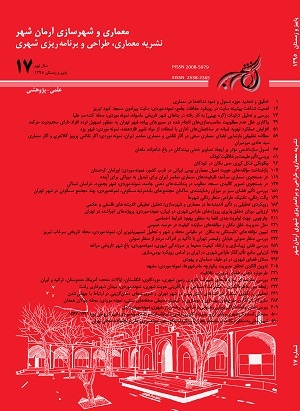 Noghrehkar, A.H., Mozafar, F., Saleh, B., Shafaie, M. (2010). Kindergartens Space Design based on the Relationship between Creativity and the Idea of Architectural Characters. Quarterly Journal of Educational Innovations, 32.47. Proshansky, H.M., Fabian, A.K. & Kaminoff, R. (1995). Place-Identity: Physical World Socialization of the Self. In Groat, L.N., ed. Giving Places Meaning. London: Academic Press. Partovi, P. (2005). Place and Space, Phenomenological Approach. HONAR-HA-YE-ZIBA, 14, 40-47. Schulz, C.N. (2009). Genius Loci: Towards a Phenomenology of Architecture (S. Ayvazian, Trans. ).Tehran, Iran: Tehran University Publishing Co.
Shariatmadari, A. (1987). Educational Psychology. Tehran: Amirkabir Publishing Co.
Sobel, D. (1993). Children’s Special Places: Exploring the Role of Forts, Dens, and Bush Houses in Middle Childhood. Tucson, Arizona: Zephyr Press. Spencer, C. & Woolley H. (2000). Children and the City: A Summary of Recent Environmental Psychology Research. Child: Care, Health and Development. 26, 181-198. Siegel, A. W. & White, S. H. (1975). The Development of Spatial Representations of Large-scale Environments. In H. W. Reese (ed. ), Advances in Child Development and Behavior, New York, Academic Press, 241–62. Thomas, G. & Thompson, G. (2004). A Child’s Place: Why Environment Matters to Children. London, Green Alliance/Demos. Youngiss, J. (1980). Parents and Peers in Social Development. A Piaget-Sullivan Perspective. Chicago: University of Chicago Press.